If you operate a bed and breakfast or an inn you may be looking for a custom guest register to capture certain information from your guests. We will craft a personalized leather guest register for your establishment with your artwork on the cover, and can create custom guest register pages in a layout to suit your particular needs. We will be pleased to help you design the art for the cover of your book, and provide a Photoshop mock up before we begin assembly so that you will know exactly how your book will be built. We will help you to determine the best method to create your cover art using one of several techniques. Your personalized guest book pages may be created with whatever entries that you like, and an image may be placed lightly behind their lines. Please feel free to contact us to discuss how we might create your custom hotel guest register. Are you looking for a custom leather guest book for a special event? Our specialty is crafting one of a kind leather guest books, leather photo portfolios, and leather scrapbooks for any purpose that you may have in mind. Assembled from the finest materials available, our personalized leather guest books may be crafted with your art on the cover, and custom designed guest book pages may be created to reflect the personality or theme of your special event. Photo pages may be easily integrated within your guest pages to provide a lasting keepsake which will preserve the memory of whatever the occassion may be. Beautiful military guest books, corporate guest books, hotel guest books, and vacation home guest books leave our doors on a regular basis personalized to the customer's specifications. Please feel free to contact us anytime to discuss how we might creat a one of a kind custom leather guest register for whatever it is that you may be planning. How would you like to have a personalized leather guestbook for your vacation home, ranch, ski cabin, beach house or business? If that sounds like an attractive idea to you, we can help. All of our products are handcrafted from the highest quality materials available with the intention of creating keepsakes that will be useful to you through years and years of service. Your guest book may be crafted from the leathers of your choice, with any logo, name, or image that you like fixed upon its cover. All guestbooks come with lined pages, but if you'd like to personalize further we can create a custom guest page layout specifically for you. Custom guest book pages may be created with your own headers, and an image lightly watermarked behind the lines to bring the page to life. 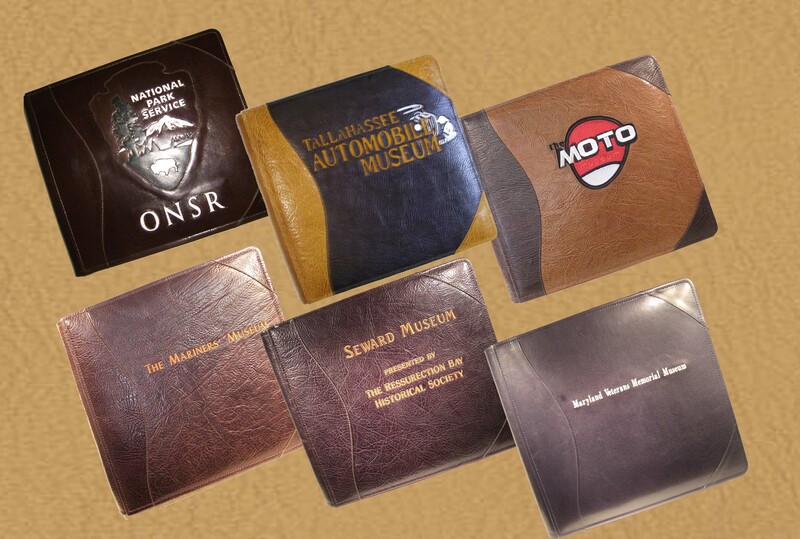 Please feel free to contact us to discuss how we might create a custom leather guest book for you. Also, please feel free to browse our website to view our other great products. We craft personalized leather photo albums, leather portfolios, leather letter pad portfolios, leather photo envelopes, and beautiful leather wine totes as well. Please feel free to contact us to discuss how we might create a beautiful personalized leather product for you. Welcome your guests to your vacation getaway with a beautiful custom leather guest book. We design and craft bed and breakfast guest registers, ski cabin guest books, beach house guest books, and lake house guest books to reflect the character of their surroundings. Each personalized leather guest book may be assembled from your choice of leathers with your logo or artwork on the cover. Custom guest book pages are also available. Your guest book pages may be designed with your own title, headers, and whatever image or logo that you like lightly watermarked behind the lines. Please feel free to contact us anytime to discuss how we might design and build a personalized leather guest book for you. 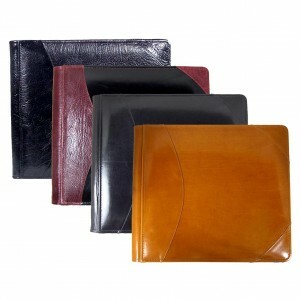 Are you looking for a handsome leather guest book for your reception area, or a company retreat. We specialize in custom leather guest books of all types, including corporate guest books, guest books for businesses, guest books for hotels and resorts, guest books for yachts, and guest books for vacation homes. We will be pleased to craft your leather guest register with whatever art you like fixed upon the cover leather, and in the leathers of your choice. Custom guest book pages are also available. We will be pleased to work out a page layout to accommodate your purpose for your book. Please feel free to give us a call anytime to discuss how we may craft a personalized leather guest book to satisfy your particular needs. Also, please feel free to browse our selection of personalized albums, photo envelopes, letter pad portfolios, and photography portfolios. Are you looking for a leather guest book for your yacht? We have created yacht guest books for vessels ranging from some of the most spectacular mega-yachts cruising the oceans of the world to lake day sailors and house boats. 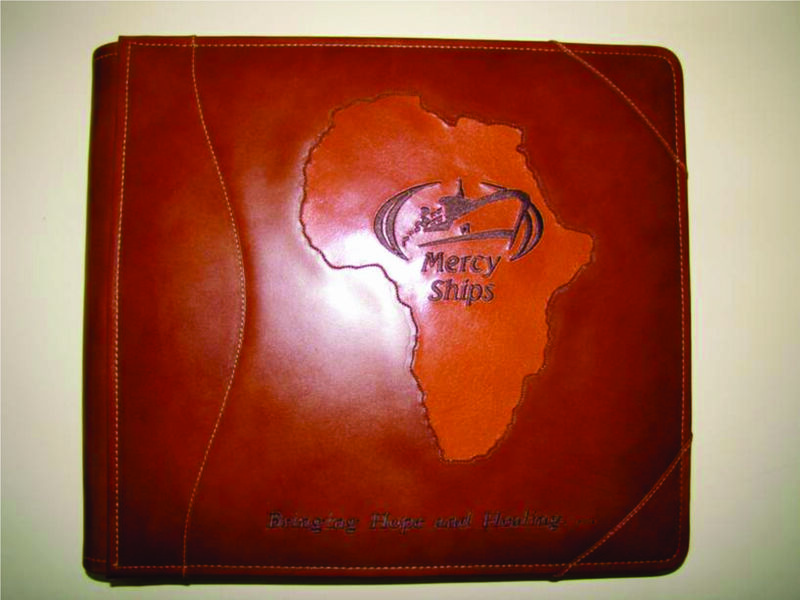 We will create a custom leather guest book with the name of your yacht or her logo fixed upon the cover leather, and custom guest book pages designed to your specifications to record the information that is important to you. 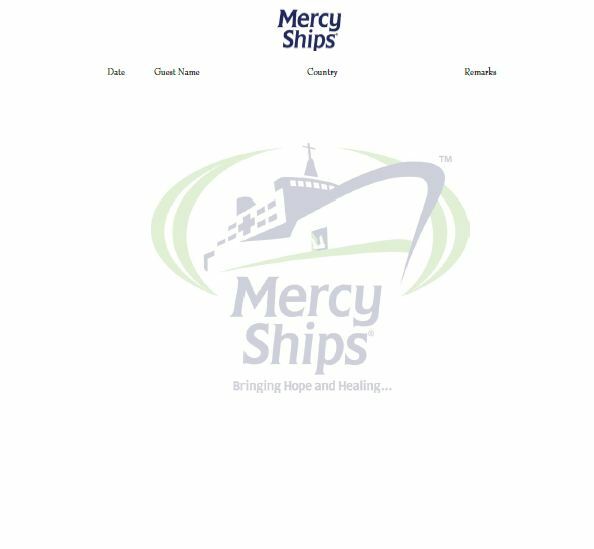 Images of your yacht, or whatever art that you may prefer, may be watermarked lightly behind the lines of your guest pages with the column headers of your choice. If you'd like to preserve some special photos within you book, it can also be crafted as a photo guest book. Our photo pages may be easily integrated within your guest pages to preserve images from events which are important to you. Please feel free to give us a call anytime to discuss how we might craft a personalized leather guest book for you. You may also like to browse some of our other products like our leather photo albums, leather portfolios, leather photo envelopes, or leather wine totes which may be found on our web site. 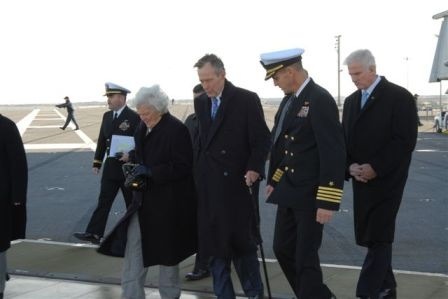 Are you looking for a Navy guest book, Army guest book, Marine guest book, Air Force guest book, or a Coast Guard guest book for a special event? 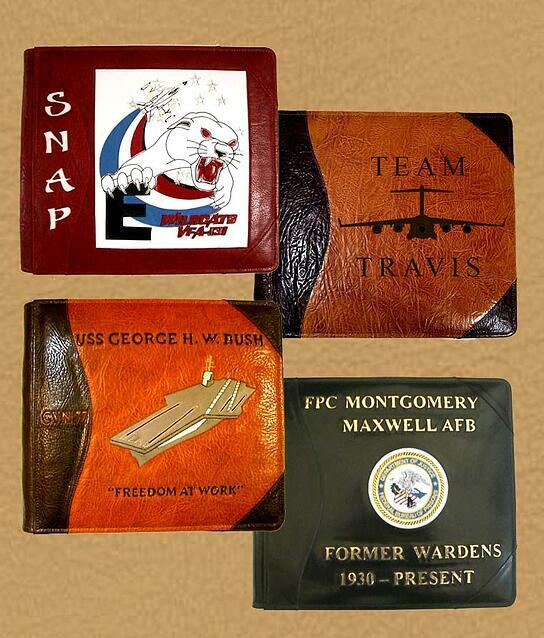 We have created custom leather guest books for all branches of the military. Our personalized leather guest books may be crafted with whatever art you like on the cover, and we will design personalized guest book pages to accommodate your purpose. We will create a page layout with your own headers, columns, and image lightly watermarked behind the lines. Photo guest books are also available. Please feel free to give us a call anytime to discuss how we might craft a personalized leather guest book or personalized photo album for you. You may want to browse our website to view other products like leather photography portfolios, leather letter pad portfolios, custom presentation portfolios, leather photo envelopes, and leather wine totes. Are you looking for a personalized leather ranch guest book? 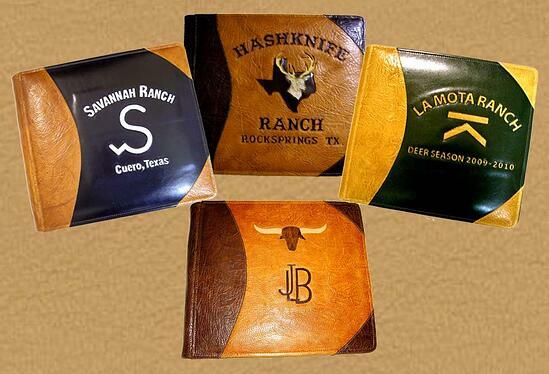 We've created beautiful leather guest books for ranches around the world. Your guest book may be crafted with your ranch brand, name, or image on the cover leather to reflect the character of your ranch. If you'd like custom guest book pages we can create a page layout with your own title, columns and column titles, and whatever image you like lightly visible in background behind the lines. If you'd like to add pictures to the names in your book you may want to have a look at our photo guest books. 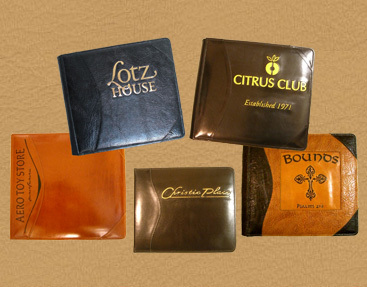 Powell Leather personalized leather guest books are the best choice for any purpose. Please feel free to give us a call anytime to discuss how we might craft a custom guest register to suit your needs. You may also want to have a look at our leather photo albums, leather photo portfolios, leather presentation portrfolios, leather letter pad portfolios, leather photo envelopes, or leather wine totes. 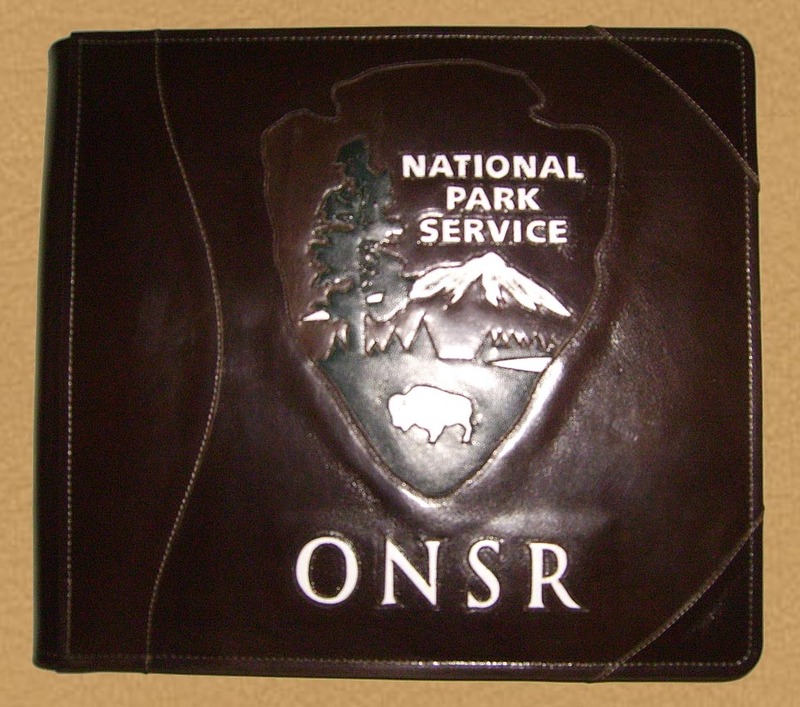 Let us craft a custom leather guest register for your hotel, bed and breakfast, resort, or inn. We will craft your leather guest book from the leathers of your choice, personalize the cover with your name or logo, and create custom guest book pages to retrieve the information that you want from your guests. Your personalized guest page layout may be created with your logo, or image of your choice, lightly printed behind the lines. All of our products are crafted to customer specifications after the orders are taken. Our large guest books may also be used to create photo guest books. Photo pages may be integrated among your custom guest pages in any order that you liketo add faces to the names in your guest book. Please feel free to give us a call anytime to discuss whatever it is that you may have in mind for your personalized guest register.